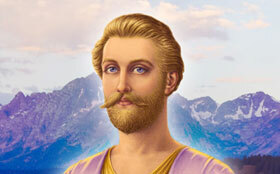 This excerpt on the power of the violet flame from a dictation by Justinius, Captain of Seraphic Bands is published in the 1993 Pearl of Wisdom Vol. 36 No. 17. 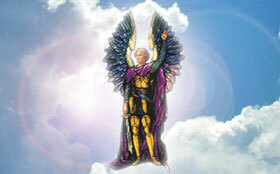 I am in charge of the seraphim of the cosmos, and I stand before you offering you the armour of seraphim. If you will but call to me daily for that armour, it will be placed upon you by two aides who will come to you and dress you in that armour and infire you with the flame that is both cool and powerful so that you may go forth as pillars of fire amongst the seraphim, serving side by side with them. And by and by, you may almost pass for seraphim yourselves and you will appreciate that honor, I can assure you. You need the violet flame so very much that I can hardly tell you how much you need it for the things that are coming upon the earth through the Four Horsemen of the Apocalypse. For they ride and they still ride and they have not yet delivered the full cup of the wrath of the indignation of the LORD God. And it does fall and the falling of that karma does accelerate. And therefore be not angry. Be not put out! And do not rebel against your God, for your God has decreed that you must bear your karma. Therefore bear it gracefully, honorably, lovingly and in gratitude. 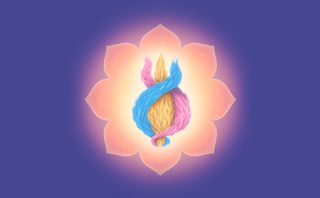 Accept your daily lot only for a moment; then pass the violet flame and the white fire through it! Cast it into the flame and go forth free and recharged by the power of Helios and Vesta. I bring you the message of the Father-Mother of the sun of your system, Helios and Vesta, that they desire you to give their mantras in the Ashram Ritual to the Great Central Sun. Yes, beloved, the sun of Helios and Vesta is the all-consuming power of God to consume the plagues that are coming upon the earth and the darkness that is covering the land. But the people are in such darkness that they do not even see the darkness! We ask you to fight for the Light, to make your calls for the Light and thereby decelerate the accelerating karma in the earth. 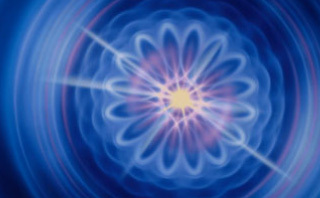 This you do by transmuting that karma through the action of the violet flame as soon as that karma descends. And how many minutes does it take you to dispel that weight when you will to still your four lower bodies, when you will to be still, to not be agitated and to give your calls to the violet flame? Well, I will tell you. Fifteen minutes is a minimum, and by the dispensation of Omri-Tas that fifteen is multiplied by the power of ten, counting for 150 minutes. Therefore, keep on keeping on! Keep on with the violet flame! Keep on with Omri-Tas! And you may see that total darkness may never come to earth (which darkness is the karma of her people in this time) but perhaps only a twilight where there is yet the possibility of seeing and making one’s way. Yes, things could become darker, beloved. We have given the antidote. Many saints have walked in robes of violet flame in this century and contributed mightily to the staying action of the Lord God whereby greater calamities and burdens have not fallen upon America.